This was the first of three places we went to see redwood trees. The lace lichen came as a welcome addition to the giant trees, one that we’d known nothing about. In such a scenic area you can count on that kind of luck. Me too. It turned the area magical. Now you have another destination for a trip. Looks like something straight out of a fairy tale. And fortunately it was a fairy tale I got to be a part of. 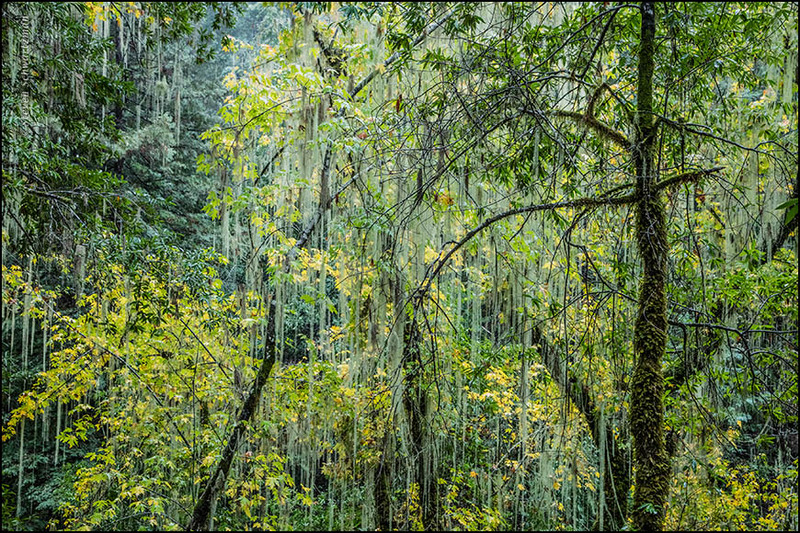 Do the temperate rain forests of our Pacific coast have a dry season, too? It just occurred to me that even though Liberia is a tropical rain forest, there is a distinct, months-long dry season. Your photos from areas like this suggest it’s a moisture-laden environment year round. The ferns (?) covering the tree trunks in the first photo reminded me that I was going to ask if the Japanese climbing fern has made it to your area. It doesn’t look like it from the USDA map, but it’s certainly a problem here. The lichen in the second photo looks like a curtain: perhaps a beaded curtain separating a nondescript shop from a bazaar. The separation is real, but so slight — it feels as though you could push aside the strands and step into a magical world. When it comes to what’s growing on the tree trunk in the first photograph, I’ve been assuming they’re mosses, but I was a stranger in a strange land there and so could well be mistaken. Whatever they are, they fascinated me. Yes, I can see the beaded sort of curtain you suggested for the hanging lichens. As for entering a magical world, all I had to do was drive into the Armstrong Redwoods Reserve and I was there. It’s so unlike anything in Texas. This is the first I’ve heard of the Japanese climbing fern, which as you confirmed from the map apparently and fortunately hasn’t made it here, and which I hope never does. I’m wondering if the lichen species you captured is a Usnea or Dolichousnea (e.g. Dolichousnea longissima). You could well be right. I’m a better photographer (thanks for appreciating that) than a botanist (which I’m not at all! ), so I’m always open to suggestions. Fern and lichen must make for some fabulous homes for the insect population. The images conjure up the thought of cool temperatures and fresh, earthy scents. I have never seen the Redwoods, only the Sequoias. I just read that a temperate rainforest has the highest biomass of any kind of environment. I assume that includes lots of insects. The redwoods are worth seeing, so I’d encourage you to add them to your list. During our week in central California we visited three sites that feature redwoods, and I’d gladly go to others if we return to that area. As far from you as central California is, traveling there would be well worth it. Next fall, society for melanoma research Congress is in Salt Lake City. If the timing works like this year, the family could then join me for a week’s holiday somewhere in the States. There maybe other opportunities too though next year. Your photography has made me think the same. Two decades ago we flew from Austin to Salt Lake City and used it as a base for visiting Yellowstone National Park in Wyoming and four of the five national parks in Utah. There are so many scenic places within a day’s drive of Salt Lake City that I’d suggest a separate trip to California, which is a world of its own. Then I prospectively wish you all a happy visit. My, I love those photos! It’s a great place, different from both your part of the country in Montana and mine in Texas. This is similar to the redwood forests here, just a few miles from the chaparral of the Santa Clara Valley. The average annual rainfall in my former neighborhood was about a foot. It is three times that much here, and is significantly more where you got these pictures. Yes, I can attest to how rainy this area was. It’s another of California’s many micro-climates, and fortunately for me as a visitor and photographer a very scenic place at that. Like another planet altogether. That fuzzy tree trunk, and the lace lichen is amazing. Yes, I have seen that British spoof about the spaghetti harvest a couple of times. 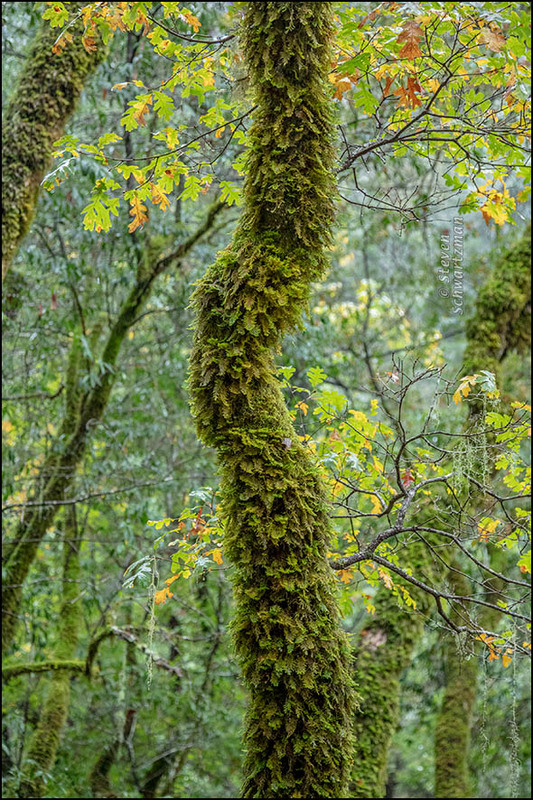 Good of you to link it to the hanging lichen of the California rainforest, which does indeed seem like an alien planet to someone from New York or Texas. I’ve occasionally thought of running an April Fool’s post here but no specific idea for a subject has ever popped into my head. This forest looks incredibly lush, Steve. Definitely not a Rocky Mountain forest. Lush it was, and one more place you can eventually visit. A fringe benefit is that it’s close to the Pacific Ocean. Now that you mention it, it’s like preserved parts of New Zealand, with redwoods instead of kauri trees. ahh, you captured the beauty of the Armstrong park beautifully here, Steve. The lichen and moss are so enchanting, and you were able to bring that forward in your photos. I really liked each photo. The turning leaves of the oak tree and the thick lichen on the trunk…lovely. Then the second photo where it looks like it’s raining lichen, wonderful. 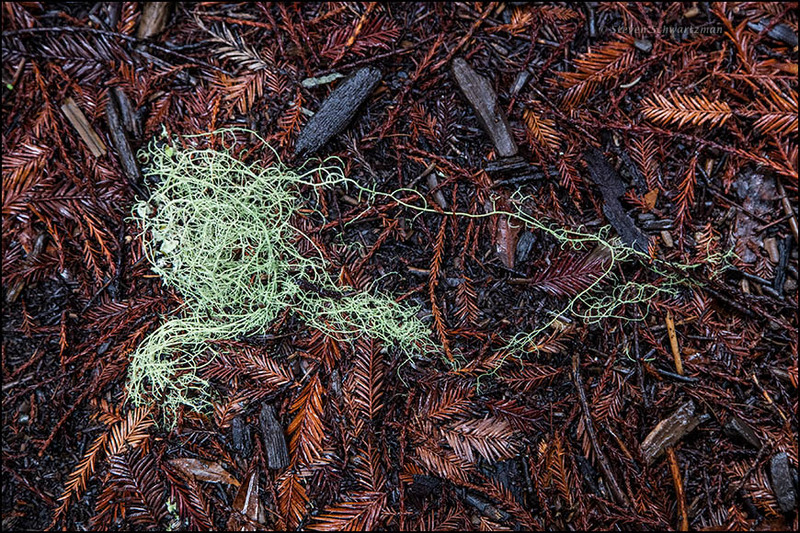 My favorite photo is the redwood-needled wet ground with the wisp of lace lichen so bright and angelic. Wonderful series. Thanks again, Jet. It’s hard to take a lot of photographic credit in such a scenic place; to some extent, all I had to do was aim, because all around me were wonderful views. The biggest challenge proved to be finding a lull in the rain so I could take pictures without getting my camera wet. For some photographs, Eve held one umbrella over her head and another over mine.